Some riders require just a little bit more from their cycling equipment, and the Star Trac Spinner® Elite, found in gyms around the country, delivers it. Along with the flexible seat base and no-slip grip handlebars found on the Spinner® Velo, the Spinner® Elite comes with such useful benefits as the Smart Release ™ System: a feature that enables the rider to stop the bike with just back-pressure on the pedals, providing the function and feel of a fixed-gear bike. You'll get increased performance from the stronger and larger crank system, too – bearings, cranks, and axels – which provide dependable performance on every ride. The seat-slider on the Spinner® Elite is micro-adjustable with intuitive, easy-to-read numerical markings, and oval-shaped, aluminum tubing creates a distinctive look and unparalleled rust-resistance. Clipless pedals take up much of the slack, as they come standard on the Spinner® Elite. 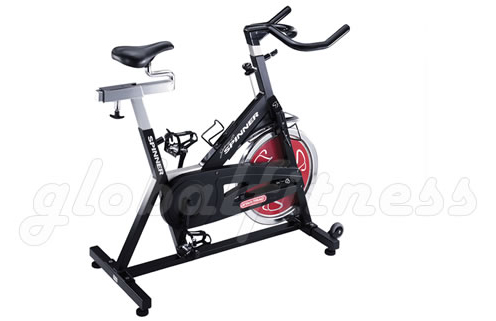 Just like at the club, you can pedal away to specially-selected music with the included Spinning® DVD's, and to top it all off, the Spinner® Elite is outfitted with dual water bottles and non-marking rubber transport wheels so you can position your bike exactly where you want it. Dimensions: 51.6" X 20" X 40"
Seat Adjustment Range: 25" - 37"